The new text on networking adopts a consistent approach to covering both the theory of basic networking technologies as well as practical solutions to networking problems. The structure of the book helps students to form a picture of the network as a whole. Essential and supplemental material to help both instructors and students will be made available from the booksite which will include visualisations of networking problems and solutions. Victor and Natalia Olifer, Moscow, Russia are a prize-winning and best-selling husband and wife author team. Collaborating with A-List translators - experts in translating computing books by eastern european authors - they will spend a sabbatical year in London designing the courseware to accompany this textbook. Chapter 1: Evolution of Computer Networks. 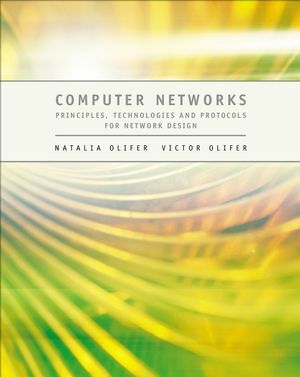 Chapter 2: General Principles of Network Design. Chapter 3: Packet and Circuit Switching. Chapter 4: Network Architecture and Standardization. Chapter 5: Examples of Networks. Chapter 7: Methods of Ensuring Quality of Service. Part II: Physical Layer Technologies. Chapter 9: Data Encoding and Multiplexing. Part III: Local Area Networks. Chapter 14: Shared Media LANs. Chapter 15: Switched LAN Basics. Chapter 16: Advanced Features of Switched LANs. Chapter 17: Addressing in TCP/IP Networks. Chapter 19: Core Protocols of the TCP/IP Stack. Chapter 20: Advanced Features of IP Routers. Chapter 21: Virtual Circuit WAN. Chapter 24: Secure Transport Services.